Redmi Note 7 Pro Photo Reveals Stunning Gradient Appeal - Playfuldroid! Redmi President Lu Weibing has shared an image of the Redmi Note 7 Pro. Although the image shows only the rear side of the phone, it does reveal its premium appeal. The image shared by Lu Weibing shows the Redmi Note 7 Pro besides the Honor V20. 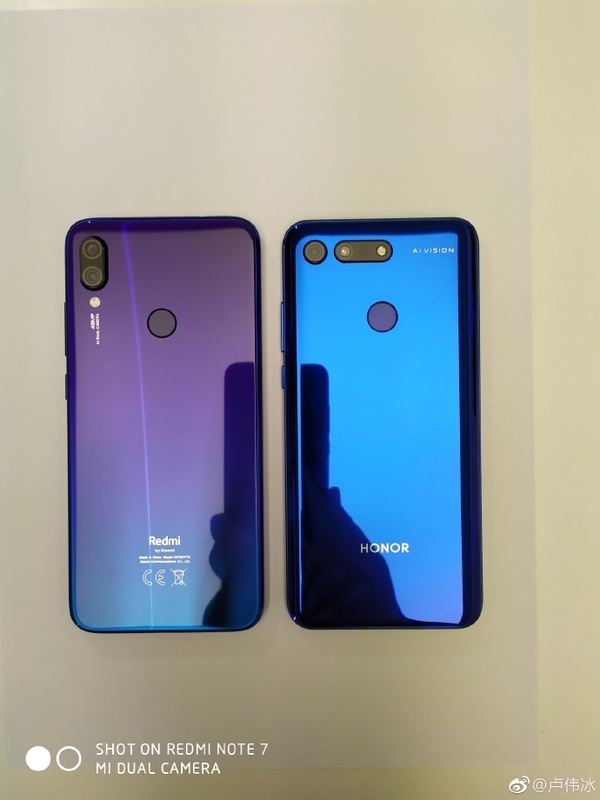 The image confirms that the Redmi Note 7 Pro with a glass rear features an impressive rear appeal that appears violet at the top and blue at the bottom. The handset features a rear-mounted fingerprint scanner which debunks the rumors about in-display fingerprint scanner. By comparing with Honor V20, Weibing claimed the Redmi Note 7 Pro features 48-megapixel Sony IMX586 sensor, LCD panel, 4,000mAh battery and 6 GB of RAM like the Honor phone. Some rumors have claimed that the Redmi Note 7 Pro will have 128 GB of storage. However, there is no official confirmation on it yet. The Redmi Note 7 Pro is confirmed to launch in the coming week. However, the exact unveil date is still under the wraps.